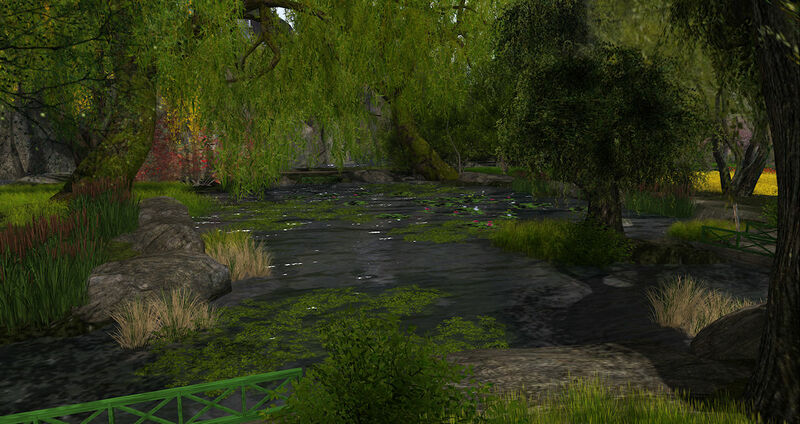 Over the last five years, I have travelled the length and breadth of Second life every day visiting countless sims while I collated other virtual explorers blogs on my Scoop-it page, Second Life Destinations, which I am proud to report has over 36000 followers. But what places do I personally like to visit and why? I thought I would share in no particular order some of my favourites with you, and why you should visit them. 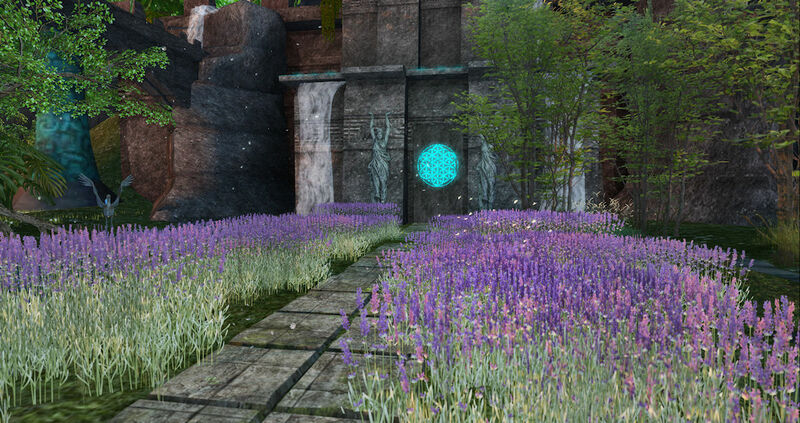 Today's selection is "On the other Side" a Homestead Region designed by Michelle (xxmichelle20xx) and Indriel (indrielx). It is often said that first impressions are important, and I love the Landing Point for the sim, a cave filled with blue butterflies, some resting on the walls, roof and floor of the cave, whilst others fill the air, dancing around you. A very memorable and spectacular entrance. 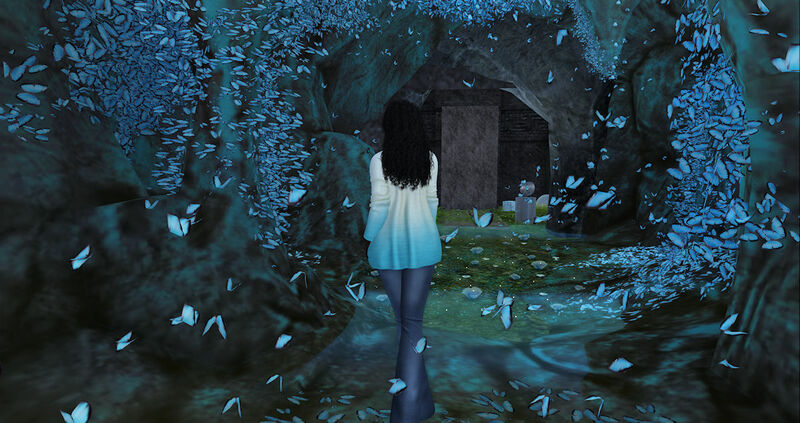 Also in the cave is a teleport Michelle's shop, (JAS) main store, a link to the Other Side Flickr group, and a blogger link board, The exit to the cave is not immediately apparent, however a large stone block when touched slides to reveal the way into the sim. This 'secret doorway' together with the kaleidoscope of butterflies makes for a great start to the visit. There are Pandas here, and I like Pandas; actually, I like Pandas very much! Of course, the world does not just exist for pandas; well not solely for them There are other animals. 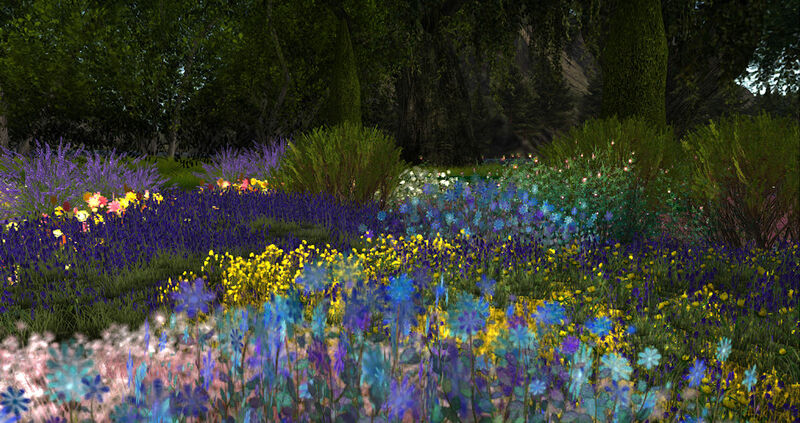 and the sim, which is, for the most part, a rural wetland is teeming with wildlife. 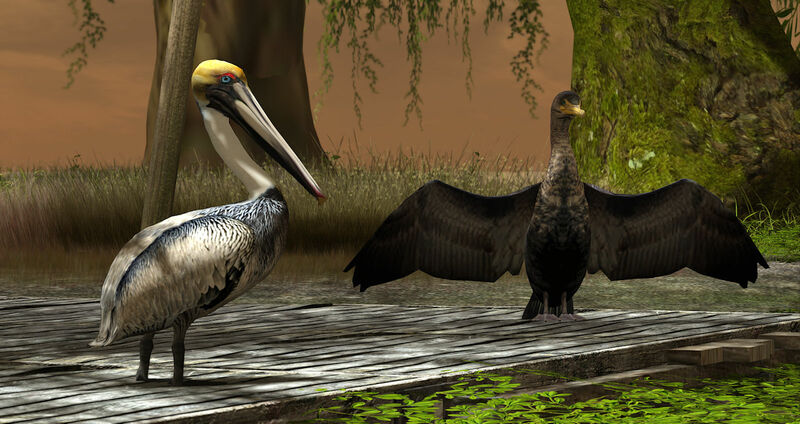 Here you can find deer, ducks, cranes, egrets, crocodiles, goldfish, cormorants, blackbirds, elephants and many more species,. 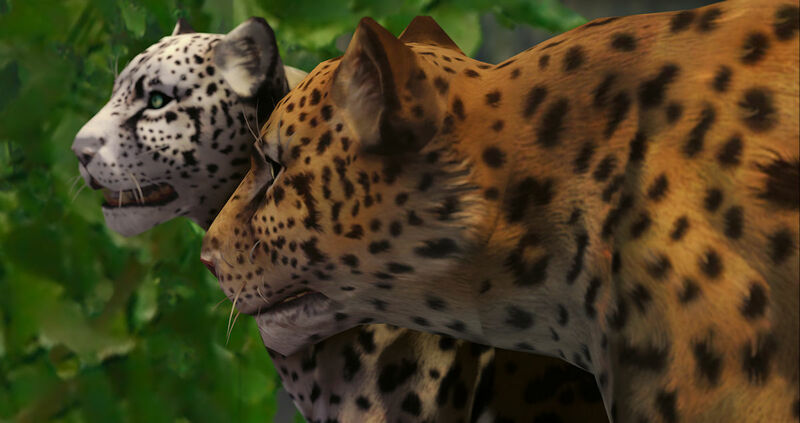 If taking pictures of virtual wildlife is your thing, then you will find 'On the other Side' paradise. 'On the other Side' is not a fantasy build but neither is it a straight virtual simulation of a real-life wetland either. Perhaps it is most accurate to say it has quirky features. In addition to deer and ducks, there is also a dragon flying above a tower, a mysterious rotating circle, inscribed with runes floating on one of the waterways, and perhaps most oddly of all, an alien paces up and down next to a crashed flying saucer. I find the juxtaposition of the normal, even mundane, with the extraordinary, very appealing. 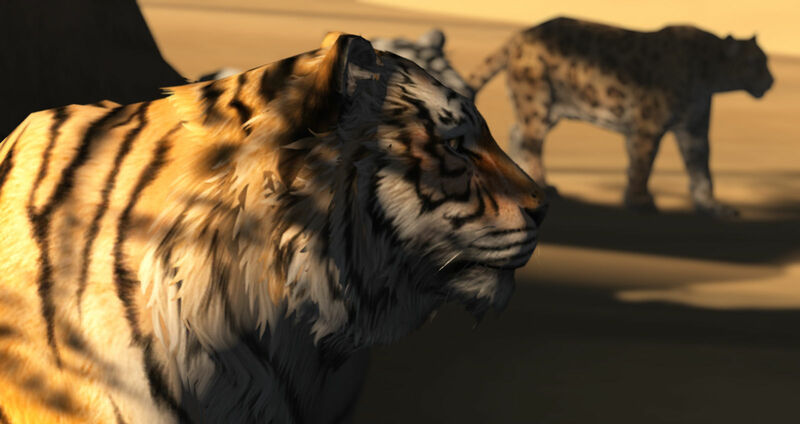 While a visually appealing sim catches the eye and draws you to it, enthusiasm for viewing alien space ships or even photographing Pandas can quickly fade. Something else is needed. On the other Side has rideable Teegle horses, surfing with free rezzable surfboards and good waves, and plenty of places to sit with a loved one or friend. OK counting has never been my strength. 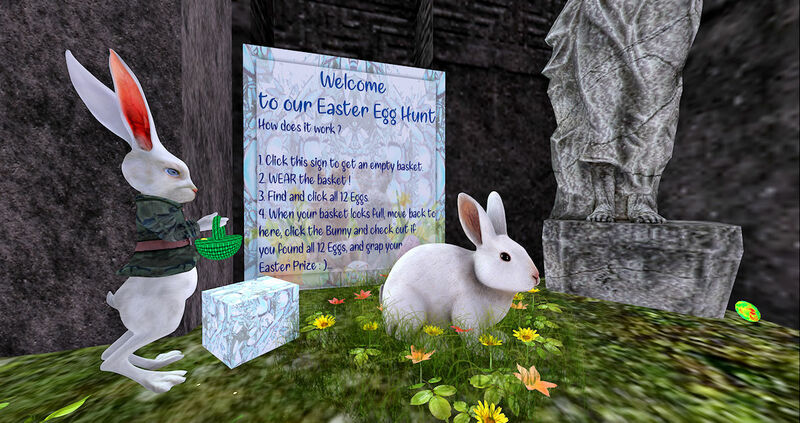 I just felt I should tell you that there is an Easter Egg Hunt going on at 'on the other Side' until the 22nd of April. I have also helpfully given you a strong visual clue as to where you might find the first egg! 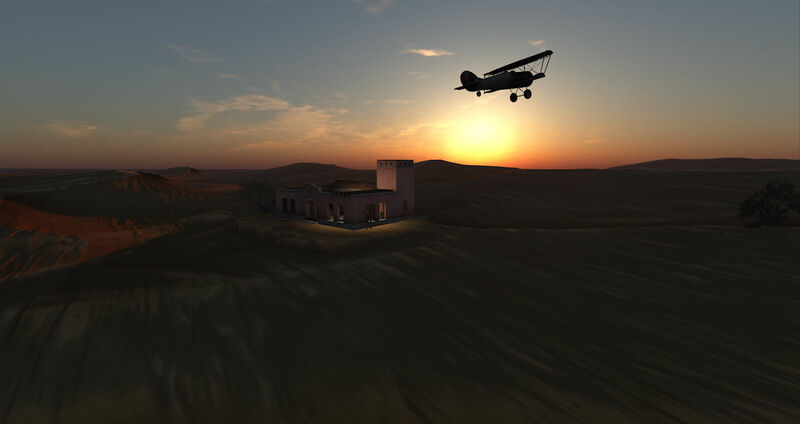 I hope that I have sufficiently whetted your appetite enough to entice you to visit On the Other Side, if I have, be sure to visit soon because the sim is scheduled to close 13th May for redecoration. 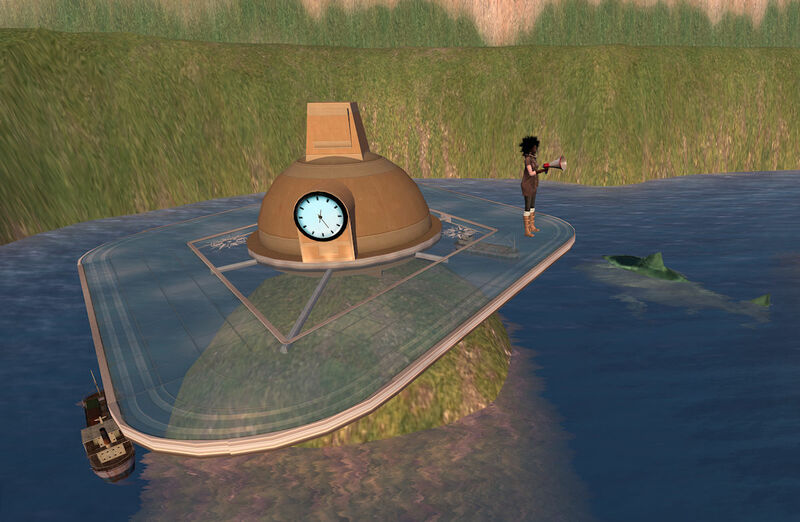 After watching a very entertaining video on TED this morning about procrastination I decided it was time I wrote another blog post about one of the many places I have visited in Second life but never get around to writing about. 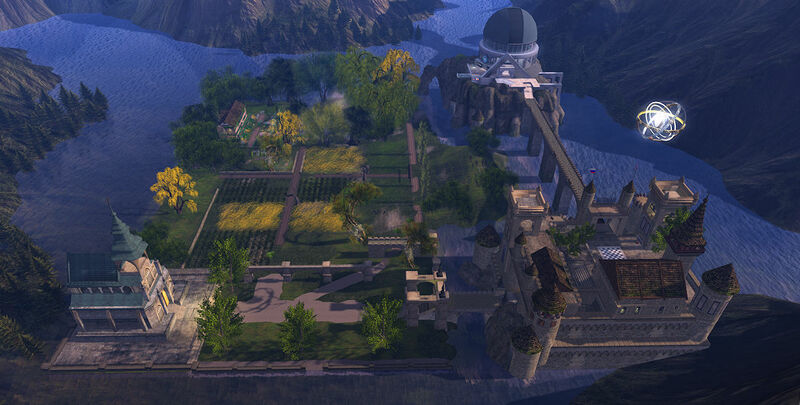 With a Castle, Church and Observatory, the Homestead Shaula Kingdom is an interesting place to visit for Second life photographers and explorers alike and I hope to write more about the sim soon, today I want to concentrate on the North West corner of the island where Ninne17 resident has recreated Claude Monet's house and garden. At this point, I have to confess that I have never visited Giverny the village in Normandy where Monet lived and worked from 1883 until his death in 1926 but I have an artistic friend who has, and she was very impressed with the build. Much simplified and smaller the House and gardens were instantly recognisable. the biggest difference being the lack of large crowds! The highlights for me are the House, which externally looks so like the pictures I have seen of Giverny, the colours of the planting and how they blend together, and the ambient sounds, of running water and birdsongs. The building itself is currently housing a exhibition of works by Paul Cezanne with many of his most famous works on show. 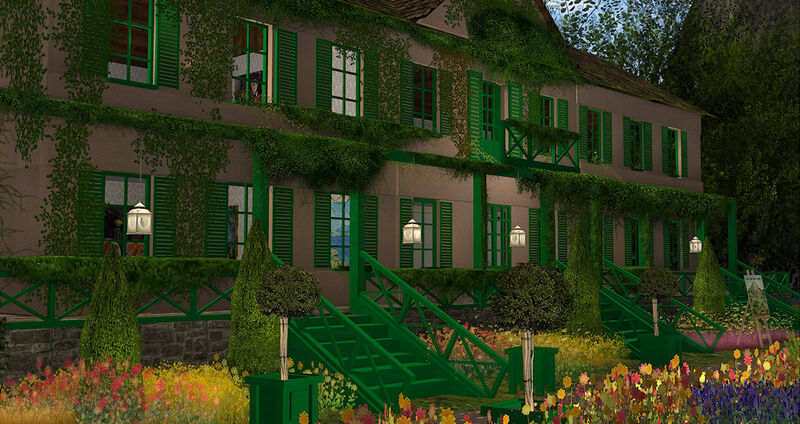 The virtual Giverny will appeal both to Second Life Landscape photographers and also as a stunning backdrop for Fashion bloggers, while art lovers will enjoy the paintings. Although still a home to shops, Soul Identity, selling Avatar accessories and Ohemo, a Fashion and & Decor store, Cherishville has indeed been transformed, the boats, fish and sea birds have all gone, being replaced by Camels crossing rolling dunes of sand, and a watering hole being used by Elephants and Zebra, watched by Lions and Tigers. This version of Cherishville will only remain for a month or so, Lam is already planning a summer build. So come and visit and bring your camera! 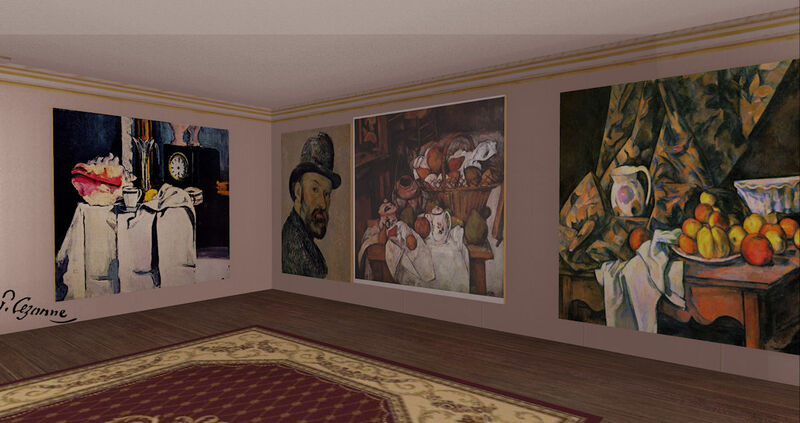 Booklovers Coffee Hour at the Shoshin Cafe in Second Life - This Sunday! The books are piled high, and Zoe Foodiboo is stood by with the Victoria Sponge Cake and Coffee, so come join the Booklovers for this month's gathering and chat about recent reads at the Shoshin Reading room, Sunday, March 4th, 1pm SLT. For more information keep in touch with the group Inworld or visit their Facebook page. Visit the Reading Room at any time. You will find the bookshelves are not simply for scene setting but feature reading material from the Shoshin Group, with links to blogs, short stories, poetry and other writings are all there, or touch the book on the table for 100 Word Stories by Lawrence Simon..
Having seen some interesting pictures of Cherishville on flickr recently I decided to pay a visit. 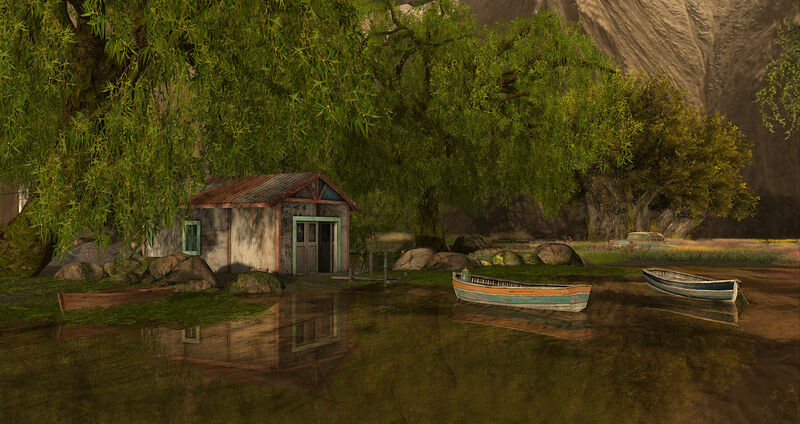 Cherishville, a Homestead designed by Lam Erin is the site of two shops, Soul Identity, selling Avatar accessories and Ohemo, a Fashion and & Decor store; however what drew to the sim was the photographic opportunities, both the marshy wetland feel, none of Cherishville is more than a metre above water level, and the collection of abandoned rusty old cars which are strewn around. Free kisses? In your dreams! "Then I caught one THIS big!" Have you ever noticed how boastful Cormorants are? The different colours and textures of the grasses and flowers draw the eye. 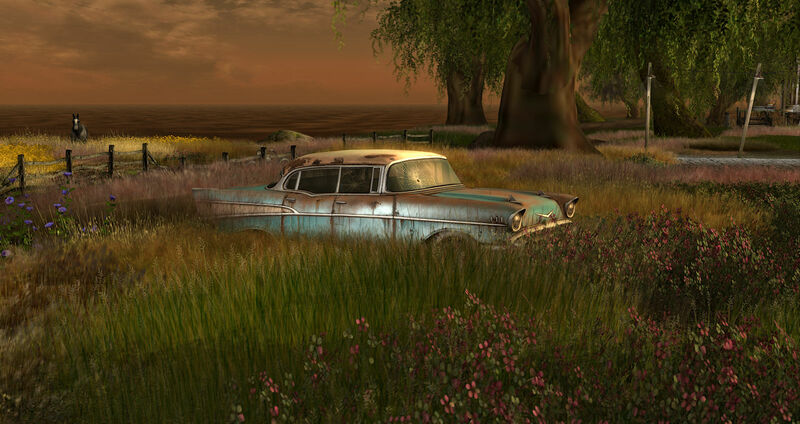 One of many abandoned cars; they create a contrast to the easy on the eye flora and fauna. Although a home for the two shops, this is also very much a photographer's sim worth a visit. For other blogs about Cherishville visit here Cherishville has it's own flickr group, here. 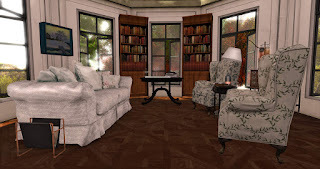 Booklovers Eggnog Hour at the Shoshin Cafe in Second Life - This Sunday! The books are piled high, the Christmas Tree decorated and Zoe Foodiboo is stood by with the mince pies and eggnog, so come join the Booklovers for their last gathering of 2017 and chat about recent reads at the Shoshin Reading room, Sunday, Dec. 10th, 1pm SLT. Visit the Reading Room at any time. You will find the bookshelves are not simply for scene setting but feature reading material from the Shoshin Group, Erotica, links to blogs, short stories, poetry and other writings are all there, or touch the book on the table for 100 Word Stories by Lawrence Simon..
Not much else to say about this destination except avoid the circling white shark created by Aura Linden. Oskar Linden's two shipping container boats on the other hand seem harmless enough. There are several videos available demonstrating Voice Echo Canyon, I have attached here a link to one by Torley.